Calling all fans of Train and the Goo Goo Dolls – it’s time to get excited, as your two favorite bands are touring together in 2019, with special guest, the wonderful soul musician Allen Stone. It's the concert you have all been waiting for! 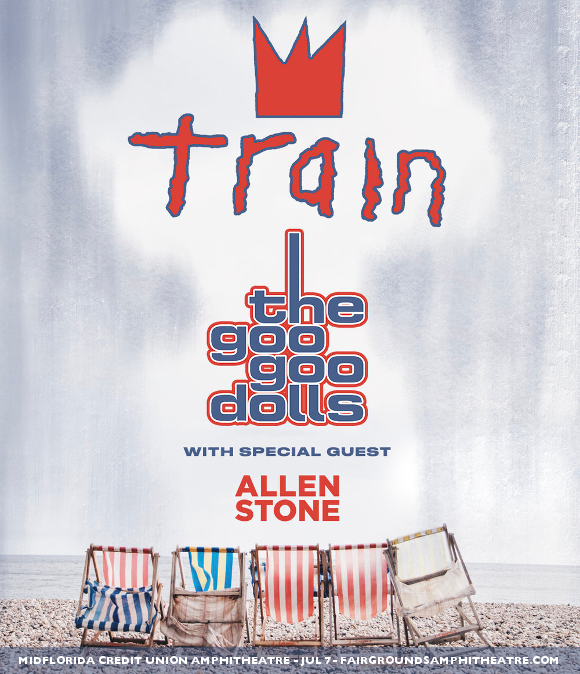 Train, the Goo Goo Dolls and Allen Stone will be heading to MidFlorida Credit Union Amphitheatre on Sunday 7th July 2019!! Get ready to sing along to all of both bands biggest hits and welcome Allen Stone to the stage – get your tickets NOW!! Formed by the original lineup of Patrick Monahan, Rob Hotchkiss, Jimmy Stafford, Scott Underwood, and Charlie Colin in 1993, Train shot to popularity on the contemporary music scene with their first, eponymous album. Their second album, “Drops Of Jupiter,” featured the hit “Drops of Jupiter (Tell Me)", which won the group a Grammy Award for Best Rock Song, and resulted in the album selling millions of copies, earning double Platinum certification by the RIAA in the United States – as well as the same prestigious honour from the CRIA in Canada! To date, it remains Train’s best-selling album, but the band have been prolific in their output of major singles since, scoring at least one major hit with just about every one of their albums!! Most recently, Train have released a greatest hits compilation album, featuring an additional new single, “Careless Whisper,” originally by George Michael, featuring saxophone by renowned sax player Kenny G!! Listen the new single below – and hurry and get those tickets, they won’t last long! !